Home-port for Vancouver-Alaska cruises, Vancouver, British Columbia welcomes more than 1,000,000 passengers at its Canada Place and Ballantyne terminals. The Port of Vancouver offers Cruise customers:(1) Modern, comfortable and safe cruise facilities near both downtown and the airport. (2) Terminals that accommodate the largest cruise ships afloat. (3) A sailing time to Alaska that allows sufficient time to enjoy an extensive Alaska itinerary. The Port of Vancouver is comprised of 26 cargo and other marine related terminals to provide a full range of facilities and services to the international shipping community. 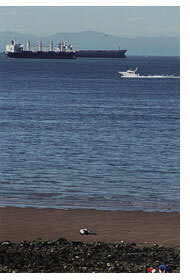 Most terminals are centrally located in Vancouver's Burrard Inlet. The exceptions are the Deltaport container terminal, and Westshore Terminals' coal handling facility, which are located at Roberts Bank, 22 km from the city centre. Collectively, Port of Vancouver terminals offer virtually no draft restrictions, post-Panamax capacity, and among the most extensive on-dock rail facilities of any North American West Coast port. The inner harbour of Vancouver British Columbia - considered one of the best deepwater ports in the world - has also become over the past 20 years, an important Pacific Northwest terminus for commercial sea/float plane and helicopter activity. According to the latest stats, the year 200O saw some 60,000 landings and take-offs in the harbour, comprising mostly commercial and scheduled traffic carrying thousands of passengers and cargo, ranking this the fifth busiest airport in British Columbia. 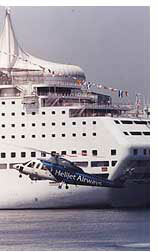 Approximately sixty percent of the movements are float/seaplanes and forty percent helicopters. Although the "High season," May through September, posts the higher movement numbers, especially with charters, regular passenger and cargo flights continue to coastal communities, the Gulf Islands, and Vancouver Island through the rest of the year, including the poor weather winter months. Its own Control Tower: As with all active flyways, rules and good conduct are essential to safety, order and efficiency. NAV Canada, the privatized spin off from the previous governing authority, Transport Canada, oversees and controls all aircraft activity about the harbour and surrounding airspace within a box like zone of roughly 3 square miles.